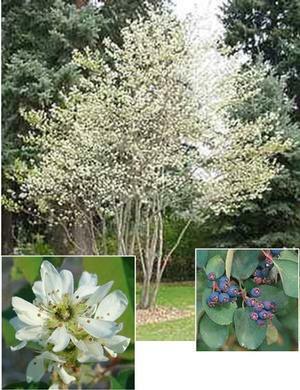 Western serviceberry is a winter-deciduous large shrub or small tree. Usually multi-stemmed, although it can be trained as a standard, it has clusters of white fragrant flowers in spring. The flowers are followed by tasty dark red-purple berries (pomes). The name 'serviceberry" is thought to have originated with early Eastern settlers in the USA who used the very early spring flowers for burial services when the ground finally thawed enough to allow them to bury loved ones who had died during the hard winter. For best fruit production, grow serviceberry in full sun. As long as the site has reasonably good drainage, serviceberry will tolerate a wide variety of soils. Propagation is from seed (cold-moist stratification), division, layering, root cuttings, grafting or budding and tissue culture.